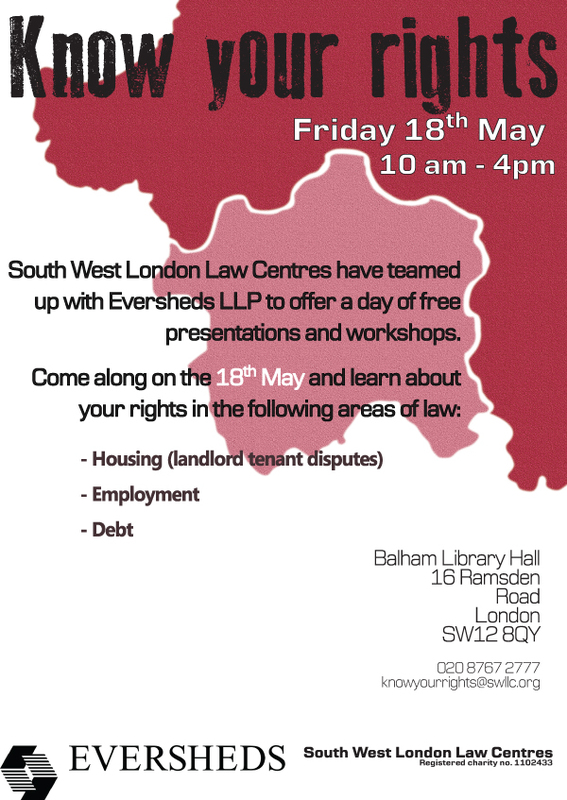 South West London Law Centres have teamed up with Eversheds law firm to organise a ‘Know You Rights Day’ in Wandsworth on Friday May 18 in Balham Library Hall, 16 Ramsden Road SW12 8QY. Know Your Rights Day is a great idea designed to provide basic legal knowledge about Debt, Housing Law (landlord and tenant disputes) and Employment Law to people in the local community. There will be a range of quality presentations and workshops throughout the day. The workshops will be interactive and a chance for visitors to ask questions and gain a better understanding of their legal rights. The event is open to all members of the public and is free of charge. This entry was posted in Uncategorized and tagged Debt, hou, Housing, Law, Legal advice by Simon Hogg. Bookmark the permalink.